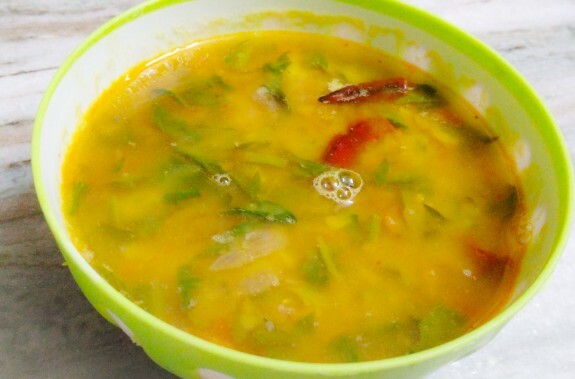 Dal palak is easy to make and very healthy recipe,spinach is high nutritional value and rich in antioxidants, iron, calcium, vitamin A, vitamin C.
Take a pressure cooker and heat up add washer arhar dal , chopped spinach(palak) ,turmeric powder and water and pressure cook for 7-8 whistle or till it is cooked. Heat up a pan add oil , cumin seeds after oil become hot , Now add asafoetida, dry red chili chopped onnion ,ginger,garlic and saute till the raw aroma of ginger and garlic disappears. Now add chopped tomato, red chili , pressure cooked dal and salt to taste. mix some water if required and cook it for 2-3 minutes. Now the healthy and delicious dal palak is ready to serve.